We teamed up with a chef to design two fantastic, healthy recipes you can make tonight! My job as a nutritionist would be a lot easier if everyone naturally craved steamed salmon and kale for dinner every night. But people — especially ultimate players after a long and tiring workout — want, above all else, food that tastes good and is easily accessible, whether it’s nutritious or not. Often, that means highly processed convenience meals, high in refined carbs and fatty proteins and low in vegetables. They often don’t offer the nutrients that will best promote recovery or fuel tomorrow’s workout. Food that is cooked at home might take a little more time to prepare, but it tastes just as good — I promise! — and is far healthier. I collaborated with Barrs Lang of Chef Barrs Creations and the San Francisco Flamethrowers, who is known throughout the Bay Area for his elaborate underground dinner parties. Together, we came up with these simple two recipes. I provided the ingredient guidelines (lean protein, whole and intact grains, tons of vegetables, healthy fats) — and he provided the culinary direction. Both recipes are super adaptable — you can sub out the chicken for another meat, fish, or vegetarian protein or add in any vegetables and herbs you have on hand. Preheat oven to 385° F.
Prepare farro: bring farro and 3 cups of water to a boil. Reduce heat and simmer for 30 minutes, or until al dente. Season chicken: rub with olive oil, salt, and pepper. Sprinkle thyme and oregano on top. Toss vegetables with olive oil, salt, pepper, thyme, and oregano. Roast on a baking sheet for 20 minutes or until tomatoes begin to brown at the edges. Boneless, skinless chicken breasts take approximately 20 minutes to cook regardless of cooking method. For this recipe, browned one side of the chicken in a pan over medium heat and then finished them in the oven. If it takes 5-8 minutes to brown, finish in the oven for 12-15 min. Internal temperature should be 160F. Let chicken rest for at least 5 minutes on a cutting board before slicing. 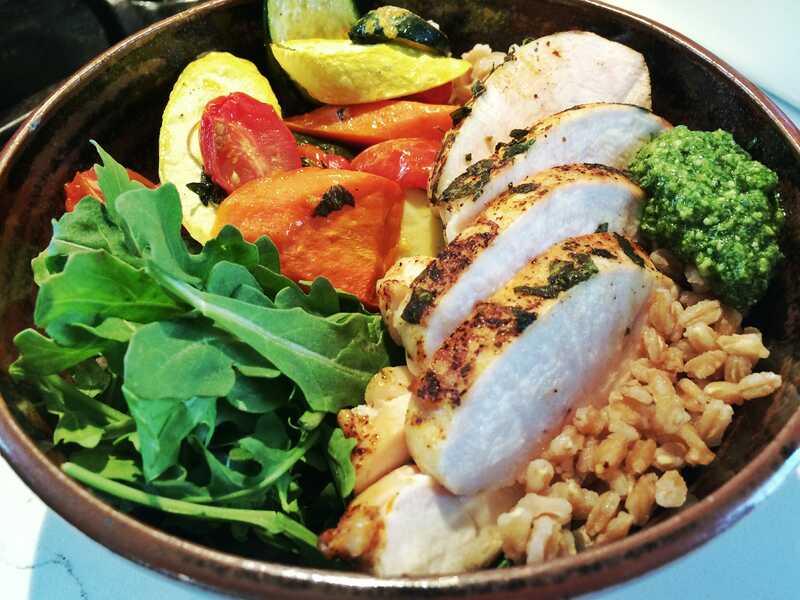 Prepare the bowls: layer cooked farro, sliced chicken, roasted vegetables, arugula, and pesto. Cut the chicken into 1/2 inch-thick strips. In a bowl, combine the chicken with soy sauce and half the ginger, garlic, and scallions; let meat marinate while you prep the vegetables. Chop the vegetables (bell peppers, zucchini, squash, and carrots) into bite-sized pieces. 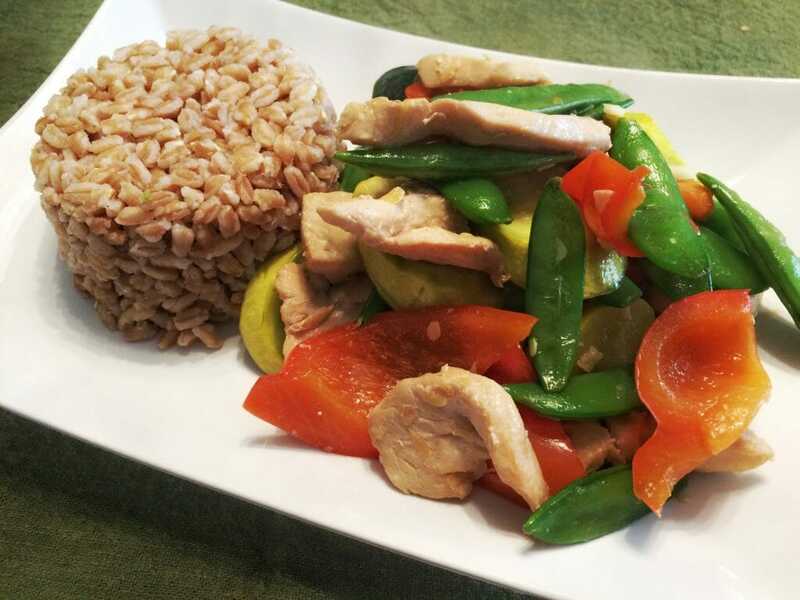 Cook the chicken first: in a heated pan, stir-fry the chicken in 1 tablespoon olive oil until almost cooked through approximately 5-7 minutes. Remove from pan; add 1 tbsp oil and remaining ginger, garlic, scallions. Stir until ingredients are coated in oil and add the carrots, frying for 2 minutes before adding the squash and zucchini. Fry for 2 more minutes before adding the bell peppers. 2-4 more minutes until the carrots are tender but still slightly crisp. Add chicken back to the pan, and finish cooking until chicken is cooked through. Season with salt and pepper if needed. Comments on "Chef-Designed Healthy, Delicious Recipes For Ultimate Players"